We’re celebrating our 40th anniversary with 40 acts of community service! Here are the latest developments from Rio staff members. The Rio Salado Partnerships department chose Project C.U.R.E. as its volunteer project. Each month Project C.U.R.E’s Phoenix warehouse sends multiple 40-foot shipping containers filled with life-saving medical supplies to hospitals in need in more than 130 countries. 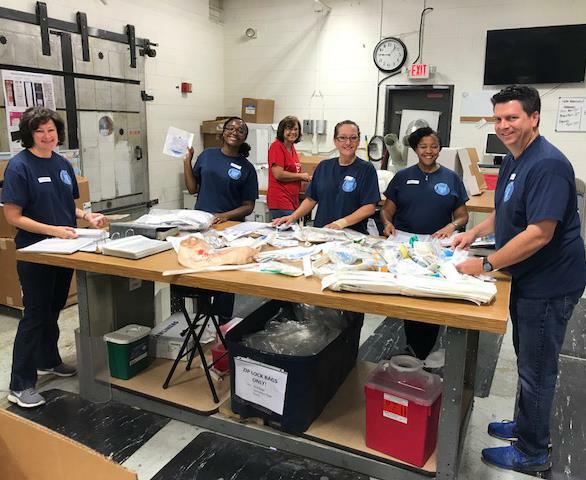 The Partnerships team volunteered for three hours to sort and package medical supplies for shipment, stock inventory, prepare shipments and load containers. In the process, the team learned how Project C.U.R.E. investigates the needs of countries and ensures that there is a clinic which can use the supplies—including difficult to get to remote areas. According to Project C.U.R.E, they have never lost a container to theft or stopped delivery within a country. Pictured here are Susan Lawrence, Robyn Sheppard, Darcy Breault, Cheri Land and Michael Turner. 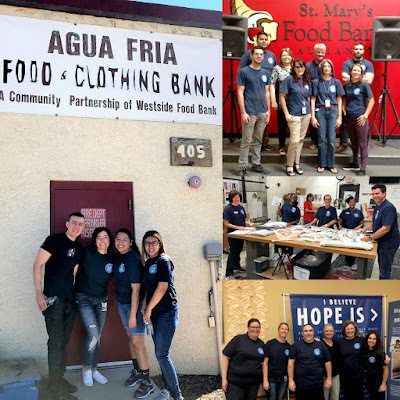 The Rio Salado Avondale Instructional Team volunteered their services at the Agua Fria Food & Clothing Bank on September 12. The team collected food and clothing that will be offered to families and individuals in the Southwest Valley who are hungry, in need or facing crisis. The team spent their afternoon sorting through food shipments and organizing clothing donations. Pictured here are Michelle De Poy, David Contreras, Jessica Alvarado and Monica Garcia. 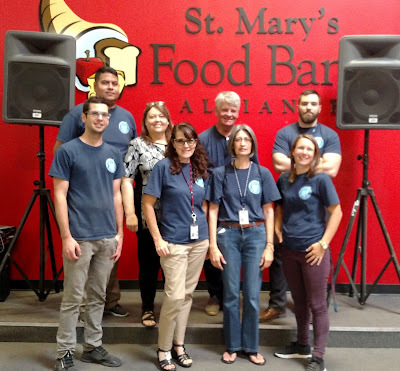 Ten members from the Rio Salado Thomas team volunteered at St. Mary’s Food Bank in Phoenix for two hours on Wed., Sept. 12. Some team members worked on production lines packing food boxes while others helped St. Mary’s with administrative duties. Pictured from right to left: Tommy Kukic, Elizabeth Kerr, Rosa Zepeda, Tom Clark, Cristina Rivera, Julie Jorgensen, Nomar Celaya, Sam Canelake. Jaime Cruz-Gama and Tanya Mijares also took part in this activity. Members of the Educator Prep Program volunteered their services at Feed My Starving Children in Mesa on Tue., Sept. 25. The team helped pack 283 boxes, which will feed 167 children for an entire year! Food boxes, containing vegetables, soy, rice and vitamin mix are distributed to diverse locations around the world for children in need. 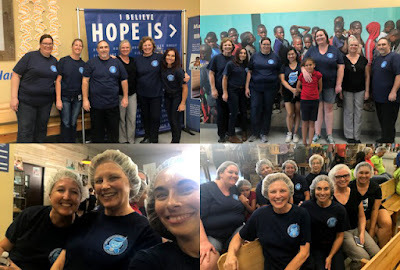 Team members included Mary Jo Krog, Julie Ferin, Christine Burke, Paulina Ngo, Jennifer Gladis, Renee Manning, Beth Hoffman, Bryan Arseneault, Diana Betts, Liz Taber and Regina Holzbaur. We encourage participants to share their photos and stories of service using these hashtags: #RioServes, #RioGivesBack #RioSaladoCollege40th.